Castle Air Museum gives visitors a peek into the past and lends insight into the evolution of aircraft and the past milestones of aviation. Preserving military aviation heritage for future generations. 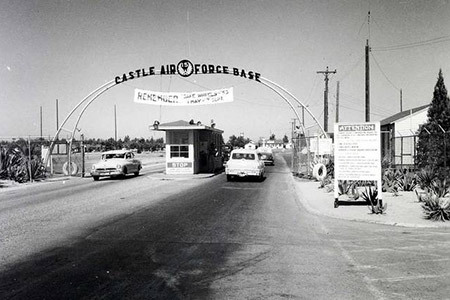 The Castle Air Museum affords visitors from the region and throughout the world the opportunity to learn the costly sacrifices of the men and women who designed, built, maintained and flew these aircraft into hostile skies to defend freedom and liberty with many making the ultimate sacrifice. The Museum also serves to educate on the past milestones in aviation and what the future of aerospace may hold in store. Castle Air Museum, located in the heart of California’s San Joaquin Valley is the largest aviation museum between Southern California and the State of Washington with over seventy restored vintage military aircraft on static exhibit with more to arrive in the future! 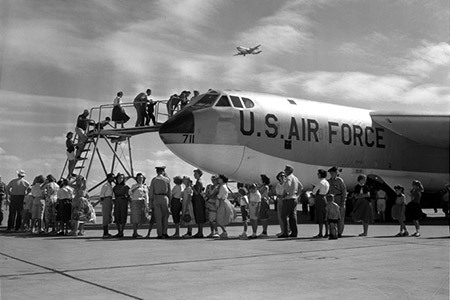 The Museum is adjacent to the former Castle Air Force Base, now Castle Airport, and officially opened to the public in 1981 as a non-profit 501c3 organization with a mission “to preserve military aviation heritage for future generations.” Today the Museum has evolved into a premier showcase for families, history buffs, schools, tourists, and aviation enthusiasts. The collection includes vintage military aircraft dating from pre-WWII to the present on approximately 25 acres of the Museum’s beautifully maintained grounds. Locating, restoring, preserving and displaying these historic treasures is a real challenge. Often aircraft are acquired in pieces from diverse locations, shipped to the Museum, and under the direction of talented and knowledgeable volunteers restored to their former grandeur. 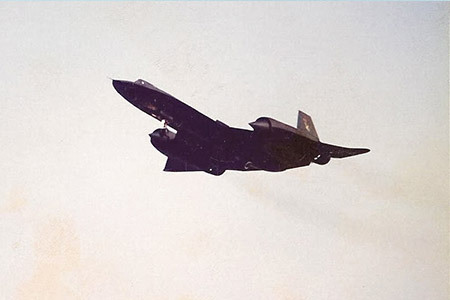 These aircraft, prior to being preserved by the Castle Air Museum have survived neglect, being targets for weapons testing, and have escaped the salvage torch to remain as testimonials to all who have served our nation and that of America’s allies to protect freedom and democracy. Complimenting, the outdoor exhibits is a wonderful indoor display which houses a fascinating collection of military artifacts including military uniforms, a cockpit simulator, historic photos, aircraft equipment and much more highlighting aviation milestones of the past century. General Castle was awarded the Medal Of Honor posthumously for his actions while leading a 2,000-aircraft bomber formation over Europe on December 24, 1944. General Castle was born on October 14, 1908, in Manila, Philipines. After serving two years in the New Jersey National Guard, he attended the United States Military Academy at West Point, New York. After graduating from the academy in June 1930, he was assigned to the Air Corps for flight training at March Field, California, and Kelly Field, Texas and completed his training in October 1931. 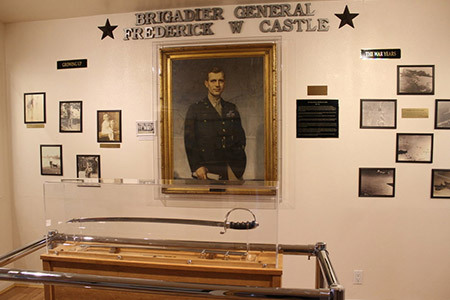 General Castle served as a pilot and Assistant Operations Officer with the 17th Pursuit Squadron at Selfridge Field, Michigan, until February 1934 when he resigned and returned to civilian life, holding reserve status with the New York National Guard. Reentering active service in January 1942, General Castle was one of eight officers selected to accompany Major General Ira Eaker to England to form the Eighth Air Force. Promoted to Colonel, he took command of the 94th Bomb Group and in April 1944, he became the commanding officer of the 4th Combat Bomb Wing. He led many combat missions, including a mission to Refensburg and in November 1944 he was promoted to Brigadier General. On December 24, 1944, on his 30th bombing mission, General Castle was killed while leading an air division of B-17's over Liege, Belgium. En route to the target, his plane lost an engine, forcing him to drop from the lead of the formation and his aircraft was then attacked by German fighters. Since he was flying over friendly troops on the ground, General Castle refused to jettison his bombs to gain speed. All of the crew, except General Castle and the pilot were able to escape before the plane exploded.